THANK YOU! ALEJO WINS HUGE VICTORY IN ASSEMBLY RACE! I am proud and humbled to earn 60% of your support for my re-election as your Assemblymember in the 30th District. I look forward to continue working hard and being your champion in Sacramento. I couldn't have done it without your support, and I will work hard to continue delivering results for our district and the Golden State. I’ve had to take some tough votes while serving in the Legislature. But it was worth it to see our economy turn around. I believe that more good jobs paying decent wages are what California needs. 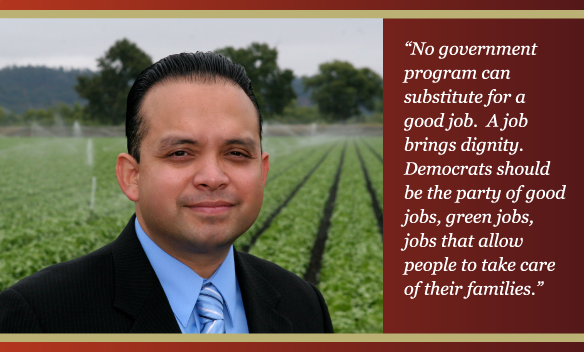 I am working to move state government away from a reliance on new programs to an emphasis on creating jobs. I’m demanding that our tax dollars be used to put our people back to work instead of outsourcing state jobs to foreign companies. And while I champion new jobs in local businesses, I also fulfilled my promise to raise the minimum wage for our hard working families. Since coming to the legislature, I’ve also stopped the million-dollar pension abuses like those at Salinas Valley Memorial Hospital and pushed to ensure quality healthcare for our local families. I also worked to stop the spiraling increases in college tuition and fees with the “Middle Class Scholarship” to make college affordable once again for our local students. I haven’t been afraid to take on tough challenges. I have made sure to remain accessible to every community I represent. I want things to continue to change for the better. I work hard to be worthy of your continued trust. I hope you will allow me to continue representing you and your family in Sacramento. Thank you for your consideration. Law degree (juris doctorate J.D.) from UC Davis School of Law, 2001. Master’s of education (Ed.M) degree from Harvard University, 2003. Dual bachelor’s of arts (B.A.) degrees from UC Berkeley. Honors graduate, 1997. Associate of Arts (A.A.) degree from Gavilan Community College in Gilroy, 1994. Watsonville High School graduate, Class of 1992. Chairman, Assembly Environmental Safety & Toxic Materials Committee, 2013-Present. Staff Attorney with the Monterey County Superior Court. Staff Attorney with California Rural Legal Assistance. Providing free legal assistance to thousands of low-income residents. Worked as a legislative aide in Sacramento for Assemblymember Manny Diaz (D-San Jose). Obtained first hand experience in passing statewide laws, assisting constituents, working on budgetary issues, & assisting different interest groups. Former alternative education high school teacher in Watsonville. Former research assistant for the Harvard Civil Rights Project in Cambridge, Massachusetts focused on education policy. President, Tri-County Assn of Latino Elected Officials, 2014-Present. California Advisory Committee of the U.S. Commission on Civil Rights, 2001-2010. Director, Association of Monterey Bay Area Governments (AMBAG), 2009-2010. Santa Cruz County Dropout Prevention Task Force, 2009-Present. Member of the California State Bar Assn & U.S. Federal Northern District Court Bar. Central CA Vice-Chair, Chicano Latino Caucus of the CA Democratic Party, 2007-2010. 2008 National Delegate for Barack Obama for CD-17, National Democratic Convention. Founding member, Pajaro Valley Cesar Chavez Democratic Club, 2004. Santa Cruz Co. Democratic Central Committee, District 4 representative, 2004-2010. Former Vice-Chair of the Watsonville Planning Commission 2006-2008. Watsonville General Plan Steering Committee, 2004-2006. Santa Cruz County Juvenile Justice & Delinquency Prevention Commission, 2003-2006. English Learner Master Plan Task Force, Pajaro Valley Unified School District, 2007. City of Watsonville Blue Ribbon Committee for Sustainable Revenue – member, 2006. County Transportation Funding Task Force – member, 2007. Board of Directors, Salud Para La Gente Health Clinics - Director, 2004-2008. Board of Directors, White Hawk Indian Council - Director, 2005-2008. 2006 Pajaro Valley Voter Registration Project Director. Registered hundreds of voters. 2008 Leadership Santa Cruz County graduate. Member, League of United Latin American Citizens (LULAC), San Benito Co. Council #2894 & Watsonville Chapter, 2008-Present. Chair, La Raza Law Students Association, 2000-2001. Lifetime Member, National Association of Latino Elected Officials Association (NALEO). Silver Life Member, National Association for the Advancement of Colored People (NAACP). Member, San Benito County Chamber of Commerce & Salinas Valley Chamber of Commerce, 2015-Present. 2014 Ben Heller Award for Leadership & Courage, Center for Community Advocacy. 2014 Legislator of the Year, CA League of Cities Latino Caucus. 2013 Migrant Education Region Xi Alumnus of the Year Award. 2013 Legislator of the Year - Pacific Water Quality Association. 2013 Champion for Immigrants Rights Award, SIREN of San Jose. 2012 Legislator of the Year - California Enterprise Zone Association. 2012 Cooperativa Campesina, Cuahtemoc Award. 2010 Distinguished Alumni Award, Community College League of California. 2009 Award of Merit, CA Legal Aid Association & CA Access to Justice Commission. 2008 California Democratic Party's John F. Kennedy Award for Outstanding Public Service (Young Democrat of the Year Award). 2008 Tony Hill Community Service Award by UC Santa Cruz (Martin Luther King, Jr. Convocation). 2006 Democratic Region 9 Volunteer of the Year. 2006 Santa Cruz County Democratic of the Year. 2004 United Way Community Hero Award. 2003 Association of Mexican American Educators Community Service Award. 2001 Martin Luther King Community Service Award. UC Davis School of Law. 2001 Maggie Schelen Public Service Award, UC Davis School of Law. 2001 Lorenzo Patino Community Service Award. La Raza Law Students Association, UC Davis School of Law. 1992 Watsonville High School Wrestling Team Captain & Co-MVP. 2X Santa Cruz Coast Athletic League (SCCAL) County Wrestling Champion, 1992 & 1990. SCCAL Wrestling Champion Runner-Up, 1991. Central Coast Section (CCS) Championships Runner-Up (2nd Place), 1992. Lost to Eric Guerrero of Independence High School in San Jose 5-4. Guerrero went on to become a 3X State High School Champion, 3X NCAA National Wrestling Champion & a 2004 USA Olympic Wrestling Team Member. 1991 CCS Championship Placer, 6th. 1994 Gavilan College Wrestling Team Captain & MVP. 1994 California Community College Wrestling State Championships Placer, 5th. 1994 Northern California Wrestling Championships, 3rd. 1994 Academic CA Community College All-American Wrestler. With my education, background and experience, I hope to serve you as your assemblymember, and to continue working hard to make good changes for our state and local communities. But I cannot do it without you, and I respectfully ask for your continued support.